Zipline: Pick up your harness at the base of the landing tower and head up the hill to begin your thrilling, 940-foot long descent back to the 35-foot high landing pad. Your aerial cruise over the ballfield could take you at speeds up to 31 miles per hour. Laser Tag: A short hike through the apple orchard takes you to a farm setting from the early 1900’s complete with a two-story farm house, barn, 1946 tractor, honey-wagon, bales of straw, hay wagon, and chicken coop (which hosts a huge flat-screen computer screen letting all know who is the professional laser tag marksman). Arm yourself with professional Tippmann Laser Tag markers, memorize your new code name, and get ready for some high-tech fun! 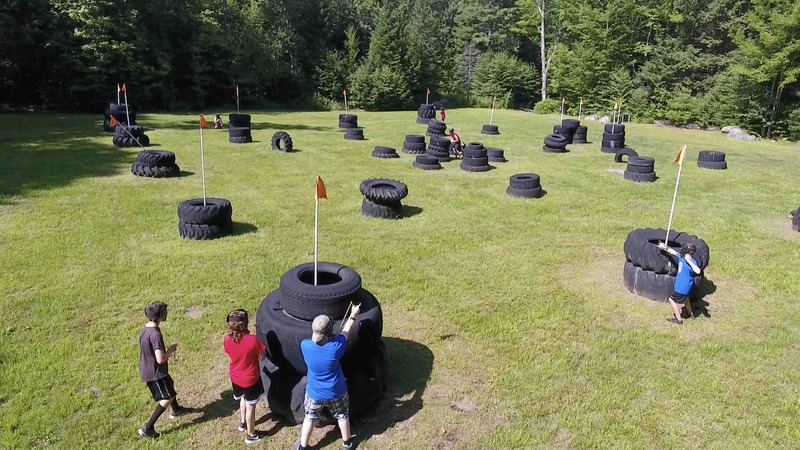 Bazooka Ball: What do you get when you combine converted Tippmann paintball markers (powered by interchangeable CO2 tanks) with dozens of soft, smiley-faced 2-inch foam balls, a 50-foot netted section of woods, and ten eager marksman? Fun! Fast-paced! Strategic! Claim the thrill of victory for your team! Paintball: Follow the back trail to the “paintball castle” located on a quarter of an acre, surrounded with New England stone walls. Armed with protective headgear and a wrist-rocket slingshot, watch your enemy cabin mates run from your dead-eye shot. The more crazy and courageous you are, the more fun this activity will be. Swimming Hole: Relaxing. Refreshing. Wet! 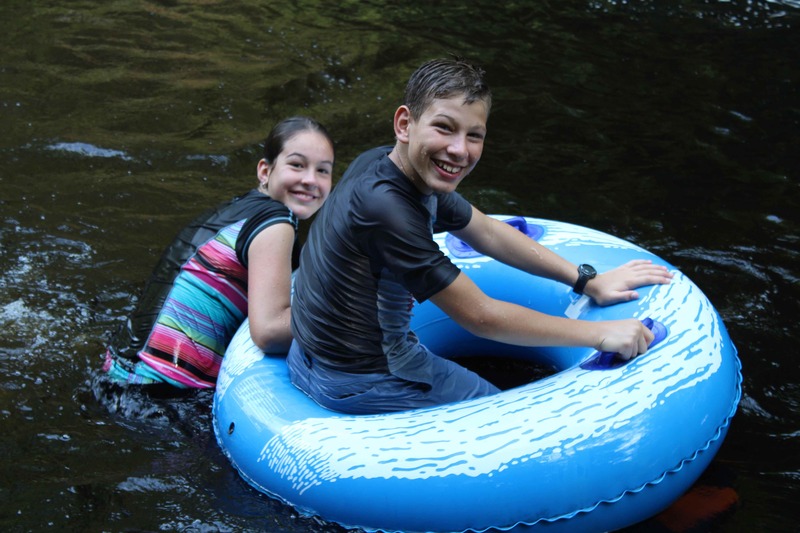 Our swimming hole is a great way to cool off on a sunny afternoon. Tubes. Tag. You get the picture. All are available with certified lifeguard supervision. Dodgeball Cage: Five on five. Place the playground balls on the center line. Both teams are touching the back walls. Ready! Go! Duck. Throw. Catch. Jump. See if you can be the last man standing in our fast-paced, netted, dodge ball cage. Get in line. It takes no time at all for you to become the king (or queen) of dodgeball. 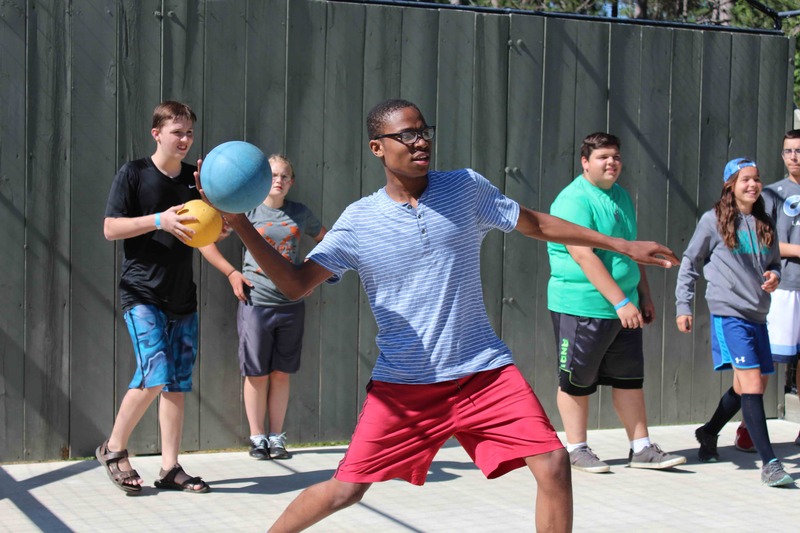 Pick Up Games/Cabin Challenges: Challenge your cabin mates or even another cabin to...Soccer. Basketball. Knock Out. Flag Football. Ninja. Sand Volleyball. Phase Ten. Horseshoes. Dodgem Pit. 4-Corner/9-hole Disc Golf. Bump. 9-Square in the Air. There are so many free-time activities and not enough free-time to enjoy them all! Game Room: The more you play the better you get. See if you can decimate five Carpet-ball challengers in a row. Become an expert at Foosball, Air Hockey, or Ping Pong. Try your expertise with Checkers, Uno, Phase Ten, Monopoly Deal, or Pool. The fun is never ending! 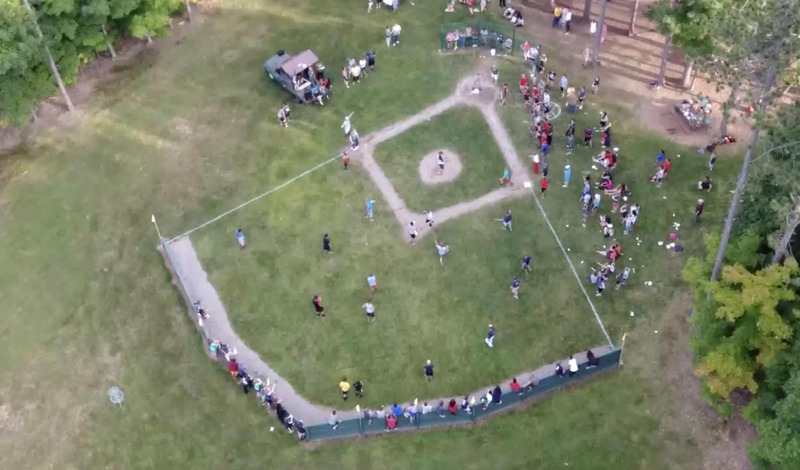 Mini-Fenway Park: Wiffle ball home-run derby, here we come! With only 95 feet to the center field “Green Monstah” wall, you are sure to impress your friends with your magnificent swing at home plate. Watch out though, we see as many home runs from the girls as we do from the guys. Cool Beans Coffee Shop: When a carriage house was added on to the farmhouse in the late 1700s, little did they know that what they were building would someday be called “Cool Beans” Coffee Shop. Enjoy a maple latte, cappuccino, or a warm hot chocolate while being observed by a huge, elegant moose and his two elk friends. For the non-coffee drinkers, there are numerous choices of fruit smoothies, teas, vanilla bean freezes, and of course, Italian cream sodas. The Cool Beans fireplace and porch offer quiet places to hide during God & I Time and freetime. The calm explodes with laughing, cries of “Uno!”, more laughing, the falling of the Jenga blocks, and even more laughing. Cool Beans is the cool place to be. Sweet Shoppe: “I scream. You scream. We all scream for Ice Cream!” And where is a better place to dive into a Coffee/Toffee/Oreo Noreastah, a huge cone of chocolate chip mint, or a creamsicle milkshake than in our 1950’s style Sweet Shoppe. 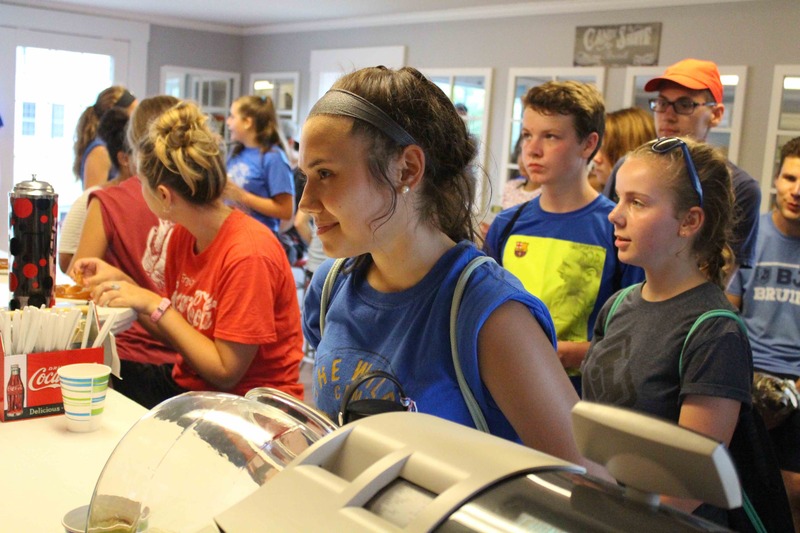 Finding a place to swivel on the stools with friends in this air-conditioned oasis of ice cream, candy, pretzels, sodas, and floats is not an easy task. Open the door, hear the staff yell, “Welcome to the Sweet Shoppe!” and you are ready to indulge in the sweetest of all treats. Craft Shop: During our Junior weeks, our Craft Shop is available and full of both finished and unfinished creative products including leather work, painting, and jewelry-making. Decorate your wooden sword and support your team by highlighting “red” or “blue” on your creative picture frames, light-up wands, and other goodies! General Store: Our General Store comes stocked to equip you for camp and life. For camp, we make sure we have in stock any toiletries that might have been forgotten in the packing frenzy to get here! We also offer team shirts, hoodies, athletic wear, and team spirit accessories. But we also want to equip you for life when you leave camp by giving you a wide selection of books, devotionals, and music that will continue to encourage and point you towards Christ after you leave camp.